Even though February is the shortest month of the year, it's hard to believe that we're already onto March. 2017 is flying by! 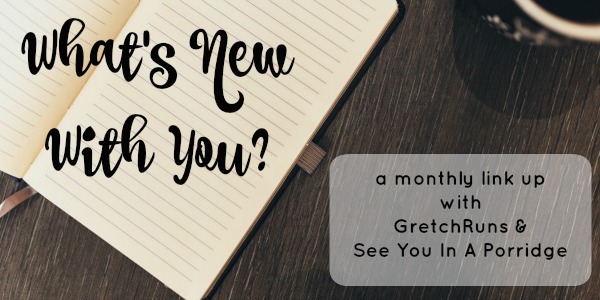 It's already time for the monthly What's New with You linkup with Kristen and me, so I'm here today to share an update on my resolutions, as well as random updates. I hope you'll join us by linking up below! Break 4 hours in the marathon. I had my first race of the year (recap here) and it went really well! I did a 20 mile run with a 15 mile race in the middle. My pace was good and right on track for my goal, but I went out way too quickly. I need to work on pacing! In February I also hit my highest mileage month ever with 135 miles. I'm starting to feel a little bit of soreness and am having no trouble keeping my easy runs slow, but overall I'm still feeling great. Buy lunch less than 2 times per month. I didn't go out for lunch (or dinner!) at all this month. I'm making a better effort of meal prepping at the beginning of the week and making sure I have enough lunches planned for every day. Some weeks I'll only prep enough for 3 or 4 lunches and think that I'll have the motivation to cook more during the week, but that never happens and I end up going out instead. I think I'll share another vegan lunch idea post in March if anyone is interested! Learn a song on piano. I'm definitely seeing a lot of improvement on the piano. I still haven't picked a longer song to learn but I think I'll stop by a music store and find a new piano book to try out. No-buy until the marathon. I kind of broke this because I did buy a few things, but I also ended up returning a bunch of stuff that's been sitting around, so I didn't actually spend any money. The running shoes that I ended up buying in January (Brooks Pure Flow 6) got returned, as well as the replacement pair that I just got (Saucony Freedom ISO). Even though I liked the Freedoms, they were just too tight and expensive. I'll keep an eye out for any kind of sale or special and will buy the next size up! Be more creative. I made a small cross stitch project. I wanted something simple and minimal for my coffee bar area, and made an easy "but first, coffee" sign with a little coffee cup. I'm regretting using the yellow thread in 'coffee' because it's hard to read, so I'll probably end up re-doing this. Disconnect daily. Dan was gone most of the month for work training, so I haven't been as good with this in February! Definitely need to get back in the habit. Save $$$!!! We did really well with saving in February. We didn't buy anything besides groceries, didn't go out to eat at all, and got our tax refund for the year. I would call February a success! I tried out a float tank...and I actually enjoyed it a lot! We went to Pittsburgh Massageworks, and the owner was so helpful and talked us through everything. I had a lot of questions and he made me feel so comfortable and safe. The tank had a door that could be left wide open or just opened a crack so that you weren't in complete darkness. I started with the door all the way open, then felt comfortable after about 5 minutes to leave it open a crack. At first, my body felt really tense and I felt like I had to work to float, but after a while I got to trust the salts in the water would keep me afloat and I really relaxed. My mind went blank and I didn't have any hallucinations or "coming to Jesus" moments that some people talk about. I wanted to close the door, but I felt so relaxed and didn't want to get up, so I just left it cracked the whole hour. The downside of this was that the parts of my body that weren't underwater were really cold. Dan had the door closed the whole time and said that he couldn't tell where the air started and the water ended, so next time I would definitely shut the door to be more comfortable. Overall, I had a really good experience and it helped my muscles relax after my 20 mile run. I would recommend trying it out to anyone! The CrossFit Open started and I'm having FOMO. Even though I don't do CrossFit, I love watching the Games and Regionals every year, and listen to a few CrossFit podcasts. The Open just started last week and the first workout is something that seems right up my alley- dumbbell snatches and burpee box jump-overs. I had such an urge just to try out the workout for myself, and it's making me want to join a local box and enter the Open next year! Is anyone entering the Open so I can live vicariously through you? I think you are right on track--I'm really excited about your marathon! The cross stitch is cute, but yeah the yellow is definitely hard to read. I didn't realise it said coffee at first! Cool that you cross stitch , but Yea, I didn't even know it said "coffee" on it. Sounds like a great month! I'd love more lunch ideas if you're wanting to do a post on that too. And dinner for that matter! I love that cross stitch idea--that's so cute! That floating tank thing sounds both terrifying and relaxing. I think it's very much a mental thing too! The cross stitch coffee cup is so cute, it's a bummer that the yellow text didn't turn out as expected. Oh my gosh, all of your progress is so motivating!! I love your doable, practical approach to goal setting. I love the daily disconnect. I think I want to try something similar - thanks for inspiring me! The float tank sounds awesome but like I'd be afraid to close the door. One of my friends did a float tank and LOVED it. I kind of want to try now! Hiiiii! I'm available to come drink beer, literally not at any point this weekend, but in general, I'm always free! We definitely went out a little fast on our first 5 mile loop, but our paces were consistent, now we just have to hold that! I would also vote to definitely re-do the "coffee" part. I had no idea that's what it said, and even though you told us I still can't tell. Sooo, yeah. Your life is WAY cooler than mine. It's so much more obvious after a post like this. My favourite part of all is the beer. Once all of our kids are a bit older (like oh, in 2078), I'd like to start home brewing! Why have I waited a million and a half years to get to your blog?! Shame on me! That being said, hello :) I'm in the market for new shoes, so I'm glad to read about the ones you didn't like. My husband and brother both have Mizuno's and they love them. Might need to check those out. I love seeing people's goals and how they rate their progress. We have made one batch of homebrew beer at our house. The flavor wasn't my favorite, but it was good. I think I prefer making wine better. I know what to expect for flavor! Love the race picture of you. It is great!! i'm always interested in lunch ideas! i do the same thing where i prepare 3-4 lunches and think i'll make another during the week and i never do. i'm trying not to eat out for lunch at all this month, i managed only once in january.. way too many to count in february lol. love your little cross stitch! the float tank sounds super interesting. i am intrigued. If I were closer to you I'd totally offer to come help you drink your beer! I'm a sucker for any hoppy beers. Float tanks have intrigued me lately and I want to try one sometime! The float tank sounds fascinating! Yay, beer! I think I mentioned that my husband makes his own beer and wine, and he has a very small keg system which makes it soo much better (but definitely an investment!) He likes red beer that is hoppy (so I wish we lived closer, lol!) but I like a lighter beer, so he usually makes two batches. The float tank sounds a lot better than what I have pictured in the past - sounds super relaxing!!! Oh, I love your little cross stitch art, super cute! I've never done a float, but I've read a lot about them and am intrigued. I need to work on unplugging more too - especially before bed! Your cross stitching is so cute! I've never disliked beer but my boyfriends love of it has totally brought it to a new level for me - like I knew nothing about it before we started dating other than I liked to drink it haha and now we go on brewery tours, to beer dabblers, etc. so I think home brewing is the next step! Someday... Maybe 2018(?!) when I attempt another marathon with a <4 goal I am going to stalk all your training plans and reports, because you are killing it! The float tank sounds really intriguing. I wish I lived closer so I could help you drink your home brew haha! Your float tank experience sounds so relaxing. Eating out is one of my major pitfalls- good job on your savings! you bought lunch twice this past month? i'm pretty sure i couldn't go five days without doing that. 135 miles IN THE SHORTEST MONTH OF THE YEAR?! Hot damn, girlfriend! You are amazing! And now I kind of sort of want to try a float tank! So cool that you got to run with Jessie :) and great time on the marathon! I also love that you're learning a new piece on the piano... I miss mine (it's at my parents' house).